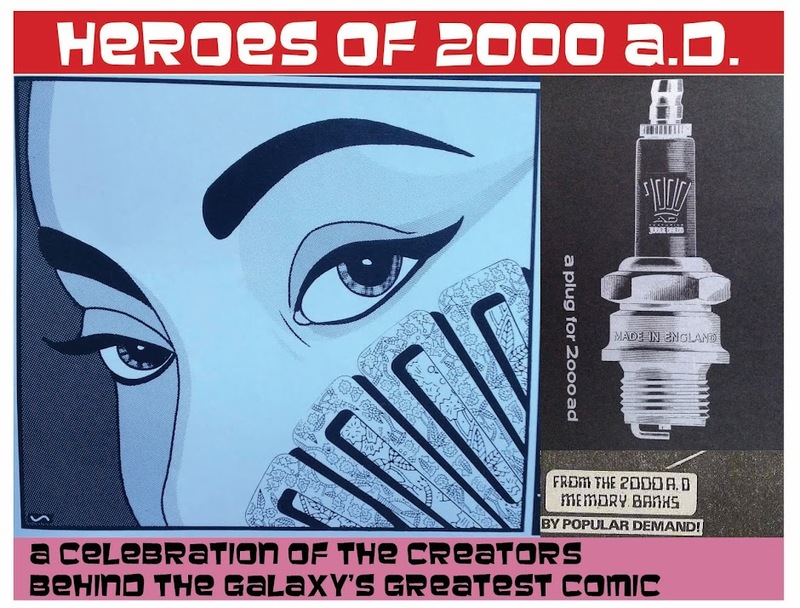 -including a one-off strip in the ‘small press’ slot of the Megazine, and an extra writer credit on his own Future Shock. No Dredds as yet. Go on Tharg, see what happens! I’m tempted to describe both ‘the wheel of worlds’ and ‘the Habitat’ as characters, too, although that’s dead pretentious. This scene-setter beautifully captures the vastness of space and the tiny, closed-in nature of life on a space station. Shiny. Clean. Simple. Elegant. Just alarming prolific and speedy. Amazing sense of space, both wide (like Brass Sun) and incredibly claustrophobic (like Brink). Unafraid to use the ‘unreal’ / shiny colours such as cyan and magenta and greens and yellows and all that jazz. 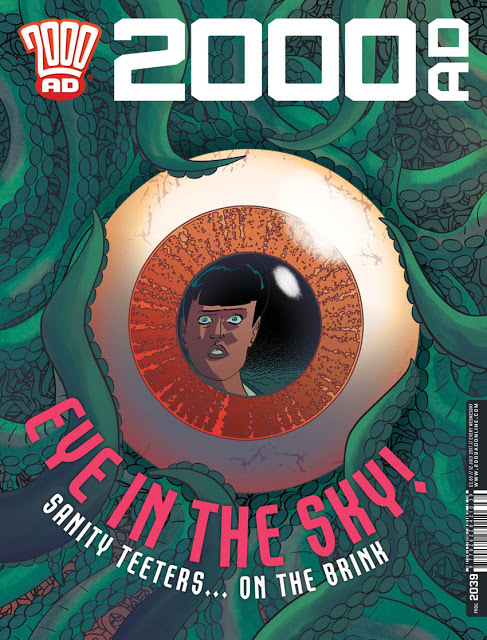 Oh, and being one of Tharg’s best ever storytellers, up there with Ezquerra and Dillon, in my view. To my eyes, Culbard sprung from nowhere. 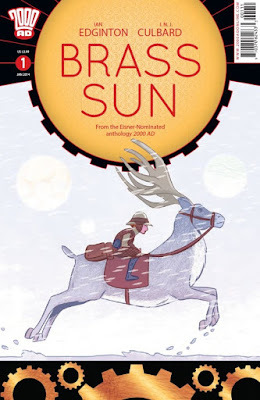 There was just suddenly a new Ian Edginton epic, with an artist I’d never heard of – Brass Sun. And it was GOOD. That shaft sinking into the snow promises so much story yet to come! Of course I immediately had to explore the world of INJ Culbard and soon discovered that he’s been in comics for ages (although not as long as his extensive CV might have you believe, he’s just unfairly fast). A lot of his early work has been in the world of retelling classic stories from the 19th and early 20th centuries – Sherlock Holmes, HP Lovecraft and such. Clearly a natural fit for working with Ian Edginton, then! A Stickleback Xmas tale in the vein of British comics past. But Brass Sun isn’t like any of those things. I suppose it has a steampunk aesthetic which has an overlap with Victorian/Edwardian styles, but really it’s all new. So important to get all those balls and poles in the right places. And, again, the promise of so many stories to explore on each one. I will say that his art does sort of look like it was done quickly, but this is not at all to say it looks rushed. In fact, it adds a sense of urgency to the strip, which helps propel Wren’s ongoing quest to find the keys and generally to keep the wheel of worlds turning. Definite shades of T2: Judgment Day in this sequence. Explosive and dynamic. 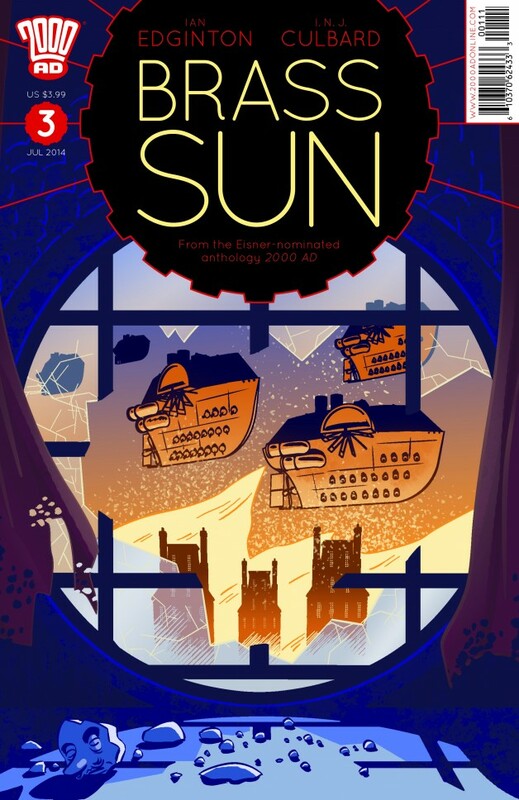 There’s a reason it’s Edginton’s best series in ages, which is partly that it has a protagonist with a specific goal in mind, and Culbard enhances that. It helps that Culbard knows how to use just a few lines on a character's face to really nail down subtleties of emotion, whether its anger, sadness or just plain sarcasm. Just enough lines, and just enough colour shading, to really show you what each character is feeling. It's not showy, not remotely 'realistic', but it damn well works. Playing with camera angles to sell the emotion. 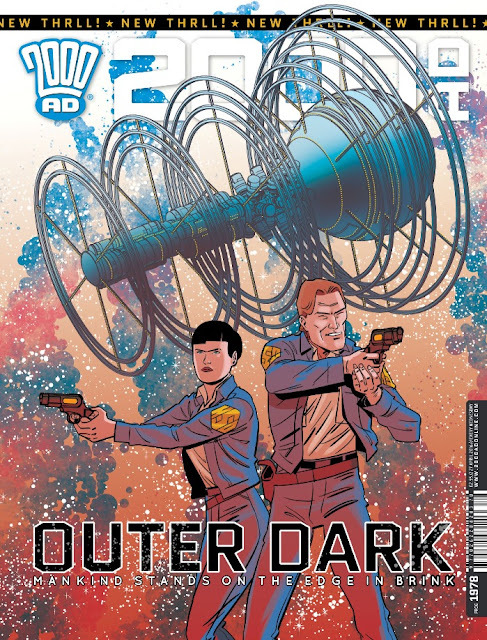 For all Culbard's cartooniness and clarity of story, he doesn't skimp on that crucial 2000AD staple, hyperviolence. And it’s partly that each new series brings with it one or sometimes two all new worlds to explore. If the airship-based gas giant world was less exciting that what had gone before, no matter, because we’ll be in all all-new environment very soon! Of course, Culbard didn't quite come out of the gate with Brass Sun levels of awesomeness. I'd forgotten it, but he had a slot in the Megazine some years earlier, with a reprint of one of his self-published comics, a Future-Shock-esque tale called Monster, that he wrote and drew. Menacing, bile-spewing old ladies, a reliable frightener. It has the basic elements of his style, but also feels less polished, and perhaps more openly influenced by other artists (Mike Avon Oeming?). Which, frankly, is as it should be for an artist's early work! I mean, it's still bloody good. Back in 2000AD, many years later, Culbard found himself with the time and space to launch into a second series, of even greater epic length than Brass Sun: Brink. And, for me, his art has bumped up a level. I think this might be the result of the setting. The Habitat, a giant collection of space stations, has to look futuristic and metallic and all that, but also run down, with weird unearthly lighting, and above all, deeply claustrophobic. 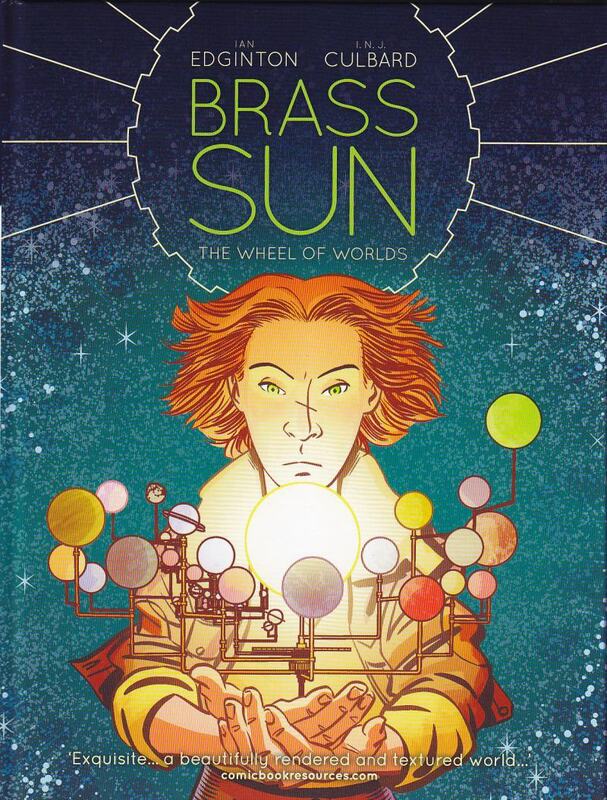 Brass Sun was mostly about wide open spaces (except for the bits between worlds, which are amongst my favourite sequences); Brink is all about being trapped. Amazing colours in this series, really sets the mood. Perfect setting for some tense chases. I love this kind of cartooning - such elegant economy of line, yet also stuffed with detail. Plus, Bridget Curtis doesn't give any hoots and is awesome. How do we know they're falling down a long way? Perspective, context, and damn fine drawing. And there's plenty of slice-of-life in there, too. In fact, these are some of the best bits. Less showy for a post celebrating an artist, mind. Never underestimate the power of a well-timed close-up. 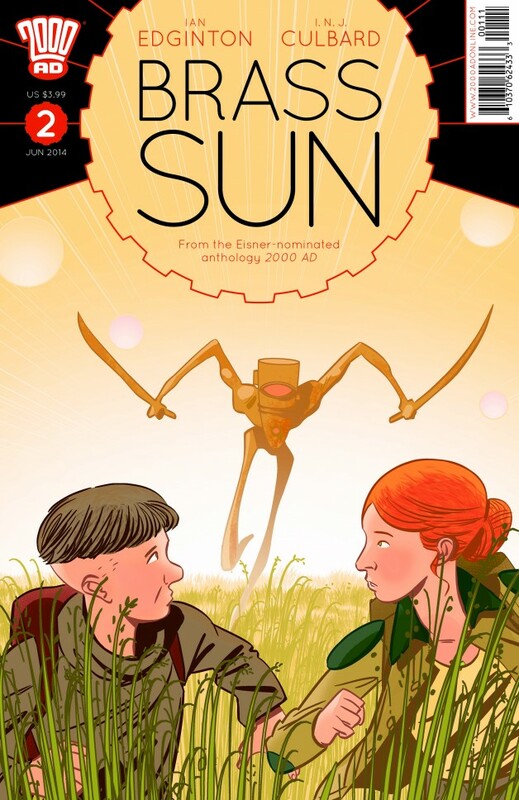 Brink will return, and with Brass Sun shaping up to have at least 3 more books (well, at current rate of in-story development), Culbard will be kept plenty busy in the pages of 2000AD. Retro-continuity Engine, eh? Someones been reading some American superhero comics. But put to splendid use within the context of this Future Shock. Outside of 2000AD, Culbard may be best known for his adaptations of HP Lovecraft and AC Doyle. Here's a Lovecraft appreciation bit. I read one and it was absolutely triumphant. Is that a Cthulu I see before me..?